Ah, the past few days have been overcast and breezy. I love this kind of weather. Clearly, I should be living in the Pacific Northwest. There has also been some "rain activity" but I wouldn't actually classify it as "RAIN," unfortunately. I mean, little drops have come down, but they never pick up their pace nor last for longer than 10 minutes at a stretch, so total accumulation is something like .000567 %. This is not going to make the grass green again, people. Maybe if it kept doing this for 3 weeks straight, but I'm doubting that will be the case. At any rate, I'm grateful for the break in the heat and the hope of rain, so I'll take it. On a totally unrelated note, I read an article last week about Katie Holmes coming back to her Catholic faith. Did anybody else see this? It was from a reliable source like Yahoo News *rolls eyes* so I take it with a grain of salt, but it piqued my interest because I had always wondered about this. I knew that Katie Holmes had been raised Catholic, and that when she married Tom Cruise, they were married in a Scientology ceremony. These are the only two facts that I'm certain of, you see. Thus, everything else that I'm about to say is pure conjecture, but that's what blogs are for, no? When they married, I remember thinking to myself, "her parents must be heartbroken that she's leaving her faith." I don't know the Holmeses, so I have no earthly idea how they felt about their daughter's marriage, but this is how *I* would have felt. I'm also presuming here that Katie did not pursue and receive a dispensation from canonical form, because if she had, then her marriage would have been valid in the Church. So, I'm making a lot of assumptions here, but bear with me. My whole point is that the situation got me to thinking about our children retaining their faith as adults. I pray for this intention weekly at Mass, that my children always stay close to Jesus and His Church. 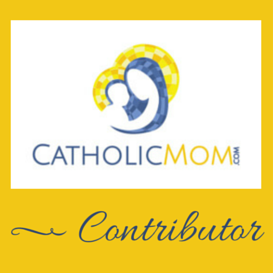 Do I think that in order to do that, my children need to marry other Catholics? No, I don't think that, actually. Would it help if they did marry other Catholics? Yes. But is such a marriage *necessary* for them to remain Catholic or even grow deeper in their faith? No, I don't think that it is. But presuming that Katie here didn't seek out her parish priest prior to her wedding to receive Catholic marriage preparation and a dispensation to marry outside of a Catholic ceremony, this is what I'm getting at. When a Catholic person does not seek out the Church for their marriage, and marries outside of Her authority, that makes me sad. Because that's often the impetus to them leaving their faith entirely. In that state, they cannot receive the sacraments, and without the sacraments, their faith will suffer. Plus, the fact that the person didn't care enough to go through the Church for the dispensation demonstrates (at least in my opinion) that they don't feel very attached to their faith to begin with. And as a parent, this would break my heart. Many times, it seems to me that the people I see not pursuing a Church wedding lose interest in religious faith altogether. This would bother me the most. It would bother me considerably less if my child became a member of another church. And even that has degrees. I would rather they stayed Catholic, but if my child became a very devout Anglican or Methodist, I would be ok with that. (But I'll just admit that I'd always still pray they would return to their Catholic roots :)). I would struggle, however, if they became a member of a non-Christian faith, probably nearly as much as if they lost all faith in God entirely. In the end, all we can do is pray. Once they become adults, it's their choice, and we have to hope that something we did as parents acts a springboard to them making their faith their own and growing in their relationship with God. So, our thought-provoking question for the weekend: what in your childhood (if anything) caused you to remain attracted to religious faith as an adult? Or alternatively, what in your childhood acted as a spark to reignite your religious faith after leaving it for a time? As I understand it, Katie Holmes was required to join the Scientologists in order to marry Tom Cruise. So if indeed she's back to the Church, it's no wonder. She doesn't seem to have been that keen on Scientology.